BLT SALAD is so amazing that when I took it to a friends house for a BBQ it was polished off and we all had 2 to 3 servings!!! 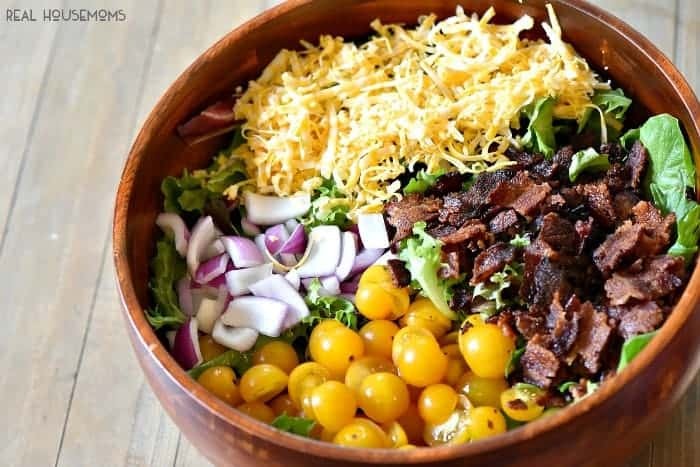 What’s not to love about a bacon salad?! The other day we went to our friends’ house for a BBQ. I love having neighbors that we can have dinner with. Our kids are the same age, and we live in the same cul de sac, so having dinner together makes the night easy. We brought a dish or two over to go with dinner and sat around talking and eating great food! One of the dishes we brought was BLT Salad with Avocado Ranch Dressing. OMG!!! So good!!! I accidentally over cooked my bacon in the oven to very crispy but not burnt. It turned out great! It added the crunch to the salad that I really like. For me a great salad is about color, taste and texture. I want to get excited about eating a salad or I’m just not going to do it. This salad was full of color and flavor and texture!! I topped it with my Avocado Ranch Dressing and we all loved it. I mean we kept going back for seconds and thirds. 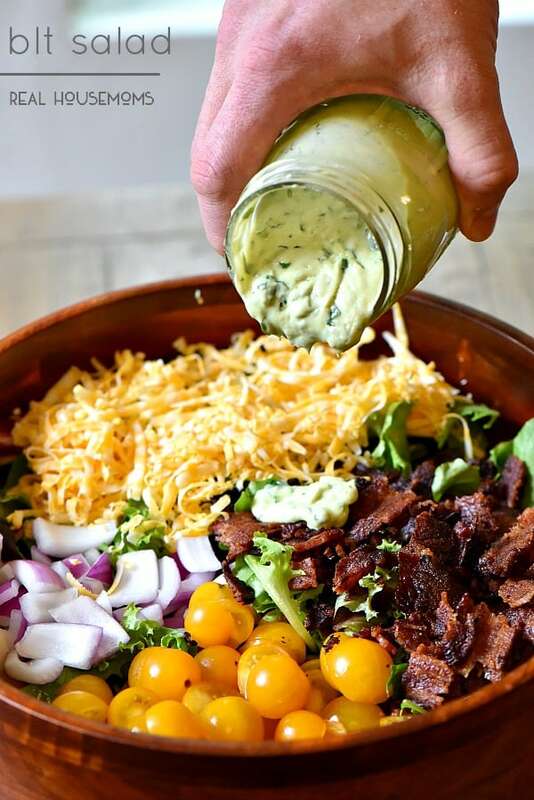 BLT Salad is my new go to summer salad to share with friends and family! BLT SALAD is so amazing that when I took it to a friends house for a BBQ it was polished off and we all had 2 to 3 servings!!! What's not to love about a bacon salad?! Why soak the onion? How long do you soak it? where’s the recipe for the dressing? I can’t wait to try it !! Looks delish!! I am making this weekend for sure. I am curious though– why soak the onions? Why must the onions be soaked? And for how long? Thank you. The recipe sounds wonderful. what is the purpose of soaking the onion? I’ve never heard of doing that. 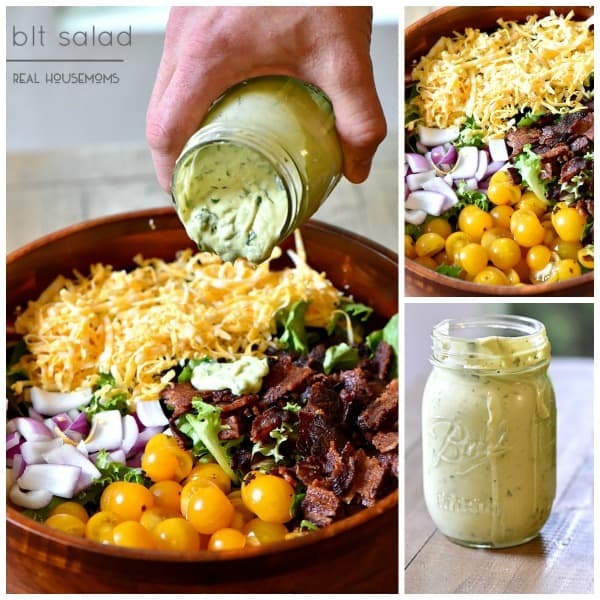 Adding to my Salads I have to try this summer – especially that avocado ranch dressing! Brilliant. Yum! I can’t wait to try this salad and the dressing! Visiting from the Sitsgirls Saturday Sharefest. Made this tonight, definitely didn’t disappoint! Didn’t have to use all the dressing and skipped the soaking part, turned out great thanks for sharing! I know this is late, but the purpose of soaking the onion is to take some of the “bite” out of it. It makes it more mild. 😉 If you don’t mind the stronger flavor, go ahead and skip the step. I love onion so I wouldn’t bother with it. This easy-to-make salad sure hit the spot for tonight’s supper! On my way to the market to pick up ingredients. Slightly over-cooked bacon is the saving ingredient for many recipes, and the perfect addition for this yummy salad. Thank you for beautiful salad photos and easy recipe. So glad to hear that! Thank you so much, Marilyn.